From the online Archive of weekly magazine The Spectator I have tried to extract all items in which C. S. Lewis’s name appears (including his early pseudonym Clive Hamilton) in the period 1920-1970. The result, pending further discoveries, is a collection of 77* items ranging in length from a few dozen words to over 2,500 words. Of these items, twenty were written by Lewis: nine essays, seven poems, and four letters to the editor. The Spectator is a British conservative magazine established in 1828 and now, as it claims, the oldest continuously published magazine in the English language. While the online Archive is a wonderful resource, perhaps inevitably it has its gaps and other imperfections. Readers interested in C. S. Lewis may save time and DOWNLOAD HERE a full transcript (PDF) of the items described above, excluding Lewis’s nine essays and seven poems. Included are his three letters to the editor in 1943 and 1945. Readers may recognize the letter published on 19 November 1943 (“Church Parade”) as the “angry letter” Lewis referred to in his 1944 “Answers to Questions on Christianity” (#15). All items are reproduced in their entirety. The sole criterion for inclusion of an item has been whether Lewis’s name makes any sort of appearance in it, including single brief and perhaps insignificant mentions. The facsimile pages underlying these transcripts are available HERE (Dropbox folder). The collection of facsimiles includes Lewis’s contributions (excepting the letter of 11 December 1942). 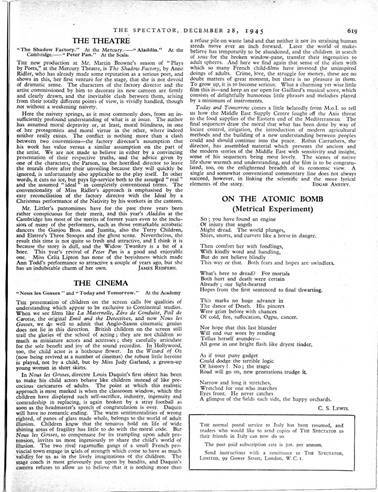 Pictured left is the page that features his poem “On the Atomic Bomb”, published in the last issue of 1945. 1. A controversy that started in November 1944 with a pseudonymous piece entitled” “What the Soldier Thinks” and continued for more than two months; Lewis’s contribution appeared on 29 December 1944 under the title “Private Bates” and a critical response followed two weeks later. 2. Fourteen consecutive pages from The Spectator of 29 April 1955 featuring a series of eight articles under the general title “Cambridge Christians”. Lewis is neither explicitly mentioned nor included as an author in these articles; for an explanation of their relevance see my introductory note on Lewis’s related April 1955 essay “Lilies that Fester”. All of Lewis’s essays in The Spectator were later reprinted along with many others in one or more collections of his short writings. For information on these reprints see www.lewisiana.nl/cslessays. The poems are found in The Col­lec­ted Poems of C. S. Lewis: A Critical Edition, ed. Don W. King (Kent State University Press, 2015). − one item which I discovered on 13 June 2016 and added that same day. This added item is the review by Bernard Williams of The Four Loves in The Spectator of 1 April 1960. − a published letter from Lewis to the editor, dated 11 December 1942 (‘Religion in the Schools’, Collected Letters II, 540), added to my list on 26 November 2018.